Over the weekend, I crocheted a basic reusable cloth to use with a certain trademarked floor sweeper meant to be used with name-brand disposable cloths. I improvised, but there are free crochet patterns for that (Tonya Hume's Swiffer Cover, Tiff Crochets Swiffer Cardi, and Gherkin's Bucket Crochet Biffer Shrug, for starters). I used the basic cloth, and it worked fine, but I found myself wanting a loopy, dust mop type of cloth to do things like clean the ceiling fan blades, so after a couple of pointlessly difficult tries at making one out of loop st squares, I finished this one - made flat in one piece, with pockets at the side to slip over the head of the sweeper. UPDATE 3 July 2008: Turns out I have an older, smaller model, and many people have the newer, larger model. Larger size is now included in the recipe. Yarn Substitutes: Pisgah Peaches & Creme kitchen cotton, Lion Brand Lion Cotton, Kitchen Cotton, Cotton-Ease, Nature's Choice Organic Cotton, Blue Sky Alpacas Organic Cotton, Dyed Cotton, Pakucho Organic Cotton, or any other worsted weight cotton or cotton-blend yarn of your choice. You could also use wool - it attract dust nicely! Measurements: SMALLER (older models) 3"/7.5cm wide, 9.5"/19cm long, LARGER (newer models) 4.5"/11.5cm wide, 10"/25.5cm long. Will fit on a Swiffer (tm) sweeper - but the sizes can vary, so check the measurements of the sweeper you are using and adjust pattern as needed to fit. The hook size will seem large for the yarn, but the loop stitch can get very tight, making it harder to crochet and resulting in a firmer fabric than necessary. Crocheted flat in one piece, with single crochet flaps sewn down along the sides so that the dust mop can be slipped on and off the sweeper head. This pattern may be used by individuals to make and sell finished items (for example, at craft fairs, on Etsy, as charity fundraiser items). Please give credit where credit is due. To make evenly sized loops, I worked the loops over a double-pointed knitting needle. I work the entire row and then slide the knitting needle out of the loops. repeat rows 1 and 2 until loop st section measures 9.5"/19cm(10"/25.5cm) long. repeat until second flap measures 2"/5cm long. Fasten off. Assemble: Fold flaps to back (smooth side) and sew the sides down, leaving top of flap open. Weave in all ends. I don't think this needs blocking, but if that would make you happy, wash with mild soap and wet-block to size. Both worked in lightweight 100% cotton yarn, these warm weather hats are quick and easy to crochet. 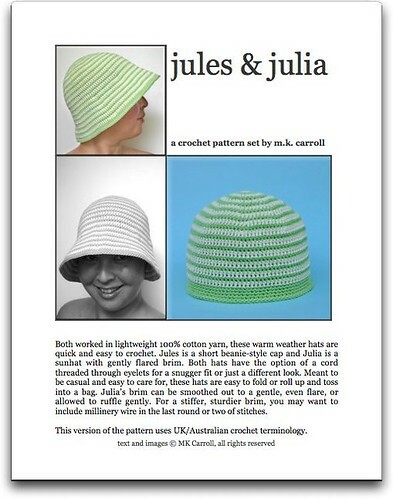 Jules is a short beanie-style cap and Julia is a sunhat with gently flared brim. Both hats have the option of a cord threaded through eyelets for a snugger fit or just a different look. Meant to be casual and easy to care for, these hats are easy to fold or roll up and toss into a bag. Julia’s brim can be smoothed out to a gentle, even flare, or allowed to ruffle gently. For a stiffer, sturdier brim, you may want to include millinery wire in the last round or two of stitches. Two versions of the pattern are currently available: one using North American (Canada/US) and one using Canadian/UK crochet terminology. Both versions give measurements in metric and non-metric. About the yarn: Skinny Cotton is a dk/sport weight/3 Light yarn (Australia: 8-ply) composed of 8 strands of tightly spun 2-ply which are then spun together fairly loosely. It makes a firm, slightly stiff fabric that is soft against the skin and which resists pilling. Possible substitutes for Jules include Blue Sky Alpacas Handspun Organic Cotton DK, Cascade Cotton Rich DK, Classic Elite Provence, Ella Rae Baby Cotton, Hemp for Knitting allhemp6, allhemp6Lux, Cashmere Canapa, and hempton; Rowan Pure Life, Tahki Cotton Classic DK, and Vickie Howell Collection Craft. Possible substitutes for Julia include Hemp for Knitting allhemp6 and allhemp6Lux, and Tahki Cotton Classic DK. For Julia, getting a fabric stiff enough so that the brim will stand away from the face is more important than getting exact gauge. Currently the pattern has written instructions only. Schematics and charts will be added at some vague date I call "the future". With that in mind, the pattern is currently priced at $3.75 USD and available as an instant download through Ravelry (please note that you do not require a Ravelry membership to make purchases). If you purchase through Etsy or this page, your name and email will be added to a list so that I can send you the charts and schematics at no additional charge when they become available. Ravelry members who purchase now will automatically have an updated version in their Ravelry personal pattern library when it becomes available. This means that if you buy now, you will eventually have the full pattern, which will sell for at least $5.50! Originally published in Knitscene, this headband pattern includes instructions for using food coloring to dye the headband after the squares and triangles have been crocheted, creating beautiful color blends. An easy project, safe and fun for kids!